Mexico’s networks and citizens are embracing mobile data at an increasingly rapid pace. Mobile connections grew nearly 5% last year, the nation’s largest operator launched mobile home broadband products, and spectrum from 2G and 3G is being converted to faster 4G. But while networks continue to invest in the latest LTE technology and new spectrum, the demands are greater than ever. Smartphone penetration is up, and new use-cases like connected wearables and fixed wireless access further challenge the nation’s mobile networks. As the industry prepares for this change, Tutela has delved into its crowdsourced dataset of billions of mobile network tests to evaluate how networks are coping with current demand, and discover which carrier is best positioned for future challenges. 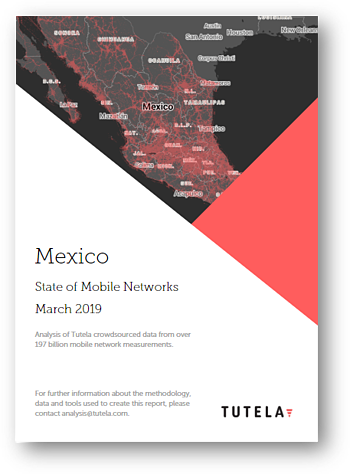 In its 2019 State of the Networks report, Tutela is using data from nearly two million unique devices to assess the network quality being provided to consumers. To compile the report, we examined a total of 5.3 billion records, including 24 million speed and 388 million latency tests conducted against our own servers.